What could be a better way to celebrate the 40th Anniversary of Creations than with a quilt challenge. 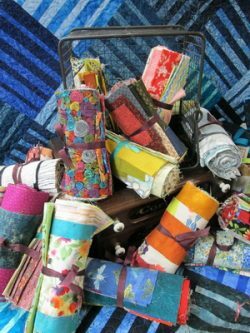 This challenge has very few rules, only one category, and all quilts will be donated to the Rainbow Room here in Kerrville which will aid children removed from their home environment. Our “Stir What You Got” quilt challenge begins August 6th with the purchase of any of our 3 yard strip rolls. You will have until March 12th, 2018 to turn in your finished quilt. Our 40th Anniversary event is March 15th – 17th, 2018. 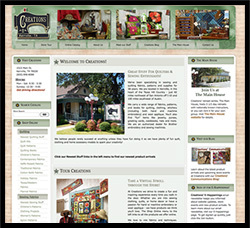 Creations opened in 1978 as a “fabric” shop as quilting just wasn’t very important. The only “quilting” fabrics around were those small VIP calico prints that had been available for years. It was in the early 1980’s that the rotary cutter, ruler and mat were created and that changed everything. Quilting took off, became more than a “granny” hobby, and has been growing ever since. We have seen so many changes and loved being part of it. 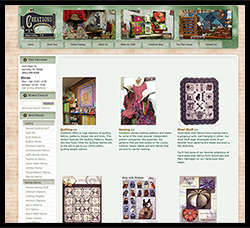 The one thing common among quilters is that they love to give away their quilts. Making a quilt for someone else seems to be the core of our industry. To help celebrate our 40th Anniversary, we will be holding our “Stir what you got” challenge. We are going to give you the chance to make quilts for someone else, use your creativity and maybe even win a gift certificate to Creations. First, how did our challenge get this name? One of our favorite people was Dr Andrew Edington, a bible scholar, speaker, and President of Schreiner University when it was a boys high school and Junior college. Now that can give you a marker as to how old we are! Anyway, Dr. E (as we called him) loved his sweets. He was from Alabama, and they know all about sweet tea in that state. It’s a little tea with lots of sugar. During one of his travels, he stopped at a local diner, and proceeded to use all the sugar bags at the table in his iced tea. When he asked the waitress for additional sugar, she looked at all the empty bags and told him to “Stir what you Got”! Over the years this has become one of our favorite mantras. To participate in our challenge, you will need to purchase one of our sale 3 yard rolls of strips. These are loosely coordinating strips in various widths to total 3 yards. Each time you purchase one between August 6th, 2017 and March 10th, 2018, you will receive the official entry form. Hold on to this form as it must accompany your entry. Use the strip set as the beginning of your quilt. Use the strips on the front, back, or binding. You can use any amount of strips and combine them with any other fabric. Complete a quilt no smaller than 30″ x 40″ or larger than 50″ x 70″. (We aren’t strict about these sizes, they are just guidelines.) Turn it in before the close of business on Monday, March 12th, 2018. 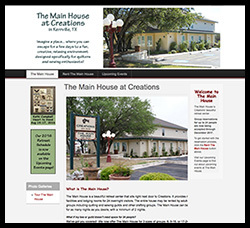 All quilts will become the property of Creations and all will be donated to The Rainbow Room in Kerrville. In 2016, there were 337 child neglect or abuse cases in Kerr County alone. The Rainbow Room is a “store like” place where thru donations caseworkers are able to get new items for the children they are helping. Won’t it be wonderful when they will be able to find a special quilt for a child in need. The Rainbow Room services children of all ages, so your quilt will find a child that needs it. The Rainbow Room in Kerrville services only children in Kerr County so you know exactly where your quilt will go. The items available at The Rainbow Room include essentials such as diapers, school supplies, hygiene products, and with our help, quilts! All of the items in the Rainbow Room are new and are either donated or purchased with money donated. Such a direct need and we have the opportunity to use our talents to help. We also will have some great prizes as our thank you for participating. The winners of our quilt challenge will be decided by viewer’s choice votes only. All quilts turned will be displayed at The Main House, our retreat center just across our parking lot, during our 40th Anniversary celebration, March 15th – 17th, 2018. You will have the opportunity to come by and place your vote for your favorite. You can vote once each day! All prizes will be gift certificates to Creations. First Place: $400.00 gift certificate, 2nd – $300.00 gift certificate, 3rd – $200.00 gift certificate, 4th – $100.00 gift certificate. The next 5 – 10 spots will each receive a $40.00 gift certificate. The one who turns in the most finished quilts will receive a $200.00 gift certificate to Creations. Everyone who turns in a quilt will receive a coupon for a 40% discount on one package of batting, any size! Winners will be notified by phone on Sunday, March 18th, 2018. If you have been avoiding entering quilting challenge because you don’t think your skills are “good enough”, then this is the quilt challenge for you. There are not critiques, just grateful kids. Join us in the fun project, maybe win something, and feel great about donating your talents. The prizes are fun, but everyone is a winner when we help a child in need. We will accept any quilts turned in, but only those with our official entry form attached will be eligible for the gift certificate prizes. 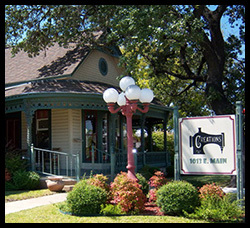 If you are not able to get to our shop, but would like to participate, just give us a call at 830-896-8088 and we will send you a strip roll. We’ll even pay the postage to get it to you! !